Introduction: Otosclerosis is a primary and exclusive disease of the otic capsule, known to affect spontaneously only humans. The most classical manifestation is conductive hearing loss secondary to stapedial fixation. Perkins introduced argon laser stapedotomy in 1980 because it appeared that laser offered some technical advantage over conventional techniques. Materials and Methods: This is a retrospective study of 20 cases of stapedial otosclerosis (10 cases in each group) operated during a period of 5 years. Our study compares a series of potassium titanyl phosphate (KTP) 532 laser stapedectomy (LS) with a series of conventional stapedectomy (CS) with respect to technical advantages, hearing results, and complications. Paired students t test was used for statistical analysis of the data. Results and Conclusion: (i) KTP LS using 0.6mm fibre is a safe and efficient technique. (ii) LS is technically less difficult, produces an atraumatic, bloodless opening in the footplate of stapes without mechanical manipulation of the stapes. (iii) The air-bone gap closure is better in laser group. Background: The textile workers exposed to industrial noise are prone to develop hearing loss concentrated mainly at high audible frequencies. It is affected by duration of exposure and type of noise. Aims: Present study was conducted to (a) investigate hearing thresholds of textile workers by pure tone audiometry, (b) correlate thresholds at 4 kHz, 6 kHz and 8 kHz between noise exposed and unexposed group and (c) study effect of duration of exposure on hearing profile. Materials and Methods: A cross-sectional study was carried out on 50 weavers of plastic industries exposed to high levels of constant noise. Objectively, hearing defects were inquired by self-administered questionnaires. 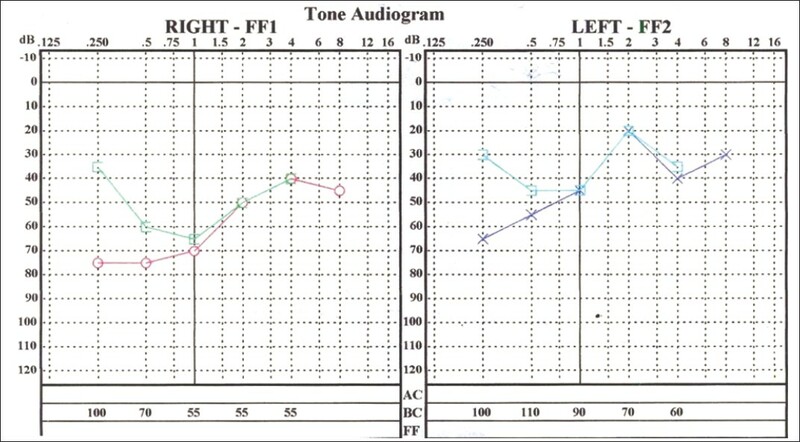 Subjectively, pure tone audiometry was carried out to measure hearing thresholds at various frequencies. It was simultaneously compared with the similar data of matched control group. Results: Prevalence of hearing loss symptom and hearing thresholds were more in exposed group than in control group. There was significant hearing loss at high frequency as compared to lower ones. Audiometry revealed notch at 4 kHz with less effect at 6 or 8 kHz, cumulative effect of duration of exposure. Conclusion: Textile weavers are more at risk to develop Occupational Noise Induced Hearing Loss (ONIHL) mainly affecting higher frequencies concentrated at 4 kHz. Despite least effects on hearing, this disease silently progresses and there is a definite scope of prevention by appropriate protective measures. 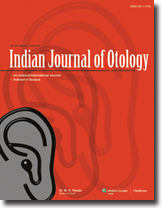 Background: This prospective study is based on the assessment of outcome of cochlear implantation taking in account various scoring systems like category of auditory performance, speech intelligibility rating, and Meaningful Auditory Integration Score. Materials and Methods: 30 children who were implanted between Oct 2007-Mar 2008 at a tertiary referral centre for were included in the study. Various factors were analysed using above scoring system on the outcome and a predictive model was derived in context to Indian subcontinent. Results: Age at implantation, duration of auditory deprivation and residual hearing at the time of implantation affected the outcome significantly. Conclusion: The predictive model can be utilized to predict preoperatively the outcome of a surgical procedure in children and to prioritize the surgery amongst a long waitlist children. Background : Chronic suppurative otitis media (CSOM) is a disease of multiple etiology and its importance lies in its chronicity and dreaded complications. Both Gram positive and negative organisms are responsible for infection of the middle ear. Due to advent of newer and sophisticated antibiotics, the microbiological flora is changing constantly. This requires a reappraisal of the flora in CSOM and their in vitro antibiotic sensitivity pattern in cases of CSOM, which do not respond to local antibiotics. The frequent presence of CSOM in general practice and its poor response to the routine treatment are the factors responsible for undertaking this study. Materials and Methods : One hundred and twenty six patients with CSOM were prospectively studied. They had chronic ear discharge and had not received antibiotics for the previous five days. Swabs were taken and cultured for bacteria. The standard method of isolation and identification was followed. Antimicrobial susceptibility of the bacterial isolates was performed by Kirby-Bauer's disc diffusion method. Results: Analysis of bacterial flora of the present study showed predominance of Gram negative bacilli (69.84%). 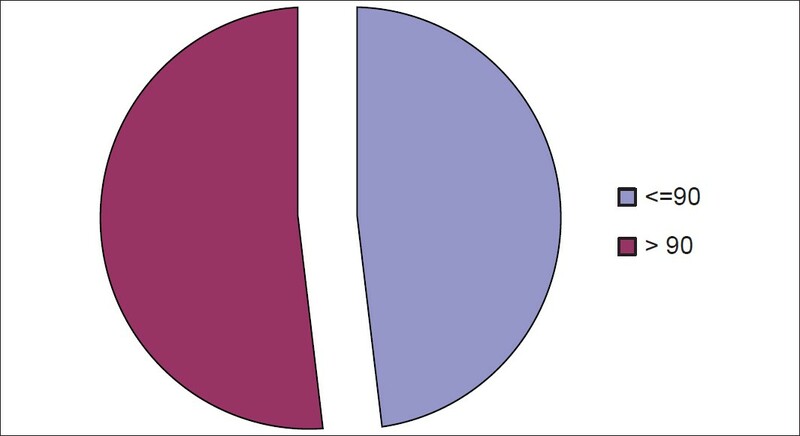 The highest incidence (45.24%) was that of Pseudomonas aeruginosa followed by Staphylococcus aureus (22.22%). Amikacin was found to be the most effective drug. Conclusion: This study suggests that the common etiological agents for CSOM were Pseudomonas aeruginosa followed by Staphylococcus aureus. Amikacin was found to be the drug of choice. Background and Objective: Bell's palsy is more uncommon in children than in adults and the diagnosis is always made by exclusion. Materials and Methods: In this retrospective study of 5 years, we diagnosed six children of Bell's palsy in age group between 4 months and 48 months. The parents were reassured and prognosis was explained in detail to them, and physiotherapy along with multivitamins as placebo was prescribed on outdoor basis. None of the children was prescribed with oral steroid. Results: All patients showed improvement with complete recovery in 67% cases over mean duration of 6.5 weeks, while partial recovery was noticed in the remaining 33% cases. Conclusion: In this retrospective study, we find that physiotherapy along with multivitamins as placebo without steroids is an effective alternative treatment for childhood Bell's palsy. Objectives: The aim of our study is to find out whether early identification and intervention prevents severe linguistic and communication delays, minimizing the need for more elaborate rehabilitation during the school years. Design and Study Sample: A Cross-sectional study was carried out on one hundred and eleven children with documented deaf-mutism presenting at the Department of Oto-Rhino-Laryngology in two different geographical regions of India. Detailed history, clinical and audiological assessment along with assessment of the language and communication skills according to American Speech Language Hearing Association (ASHA) guidelines was done. Results: The children were predominantly male, of low socio-economic background, presented for rehabilitation, mostly after the age of six years. They commonly had more than 70dBHL (decibel hearing level) hearing threshold. The study found that the children who presented early for diagnosis and hearing aid usage had better response to rehabilitation. Conclusion: It is important that hearing loss be detected at an early age and amplification should be introduced as early as possible once there has been a diagnosis of a hearing loss. So that early intervention can have an impact on speech and language development. Without concurrent follow-up program, identification of hearing loss early in children is meaningless. Introduction: Numerous splints and ear guards have been described for dressing in microtia patients but each has its own merit and demerit. We have devised a simple method of applying such dressings on the operating table. Materials and Methods: A rectangular piece of lubricated dressing material like paraffin gauze or antibiotic impregnated dressing is cut. The dressing material is than split partially into one thirds in a staggered manner. The dressing material is then applied to the retroauricular sulcus. The fans of the dressing material are then turned onto themselves over the projecting ear which makes the dressing stable in its position. Results: The authors have been regularly using this dressing for reconstruction in all cases of microtia. The dressing stays firmly in place in the peri-operative period and is subsequently replaced by stents. Conclusion: It is a low cost, readily available, simple, fast and effective method of ear dressing in the peri-operative period for microtia cases. Auditory neuropathy (AN)/auditory dyssynchrony (AD) is a very often missed diagnosis, hence an underdiagnosed condition in clinical practice. Auditory neuropathy is a condition in which patients, on audiologic evaluation, are found to have normal outer hair cell function and abnormal neural function at the level of the eighth nerve. These patients, on clinical testing, are found to have normal otoacoustic emissions, whereas auditory brainstem response audiometry reveals the absence of neural synchrony. Unlike space-occupying lesions, radiologic evaluation reveals normal results. Patients with auditory neuropathy require a different management approach to their auditory and communication problems from approaches used with patients with usual peripheral hearing losses.